There is one piece of clothing all rock stars, mansion owners and dandies have in common: a velvet blazer. However, it’s not easy to wear a velvet blazer with style. Velvet is soft to touch, smooth and has a subtle sheen; it’s a fabric that gets you noticed. We’ve asked experts in mens velvet blazers to give us some tips on wearing this clothing item in a best possible way. The velvet jacket is very trendy at the moment. Since it’s not meant to be worn every day (unless you’re a celebrity), it means you can experiment with this clothing item. However, pick style and color that will match your current wardrobe and personality. Or go for something printed, for a wild, party look. 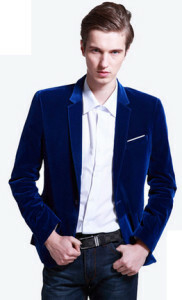 If you’re wearing a mens velvet blazer as a formal jacket, you should keep it taut, trim and slim. It’s a perfect dinner jacket, but make sure the fabric is the highlight of your outfit. Black velvet blazer with neutral and clean trousers, shirt and accessories are spot on. Pair your jacket with a black bow tie (it can be velvet, too) and a crisp white shirt, patent leather Derby shoes and black slacks and you won’t get unnoticed. Of course, you can go with other hues, such as midnight blue, brown, red, moss green or dark purple. Can velvet blazer be worn casually? Yes, of course! Slim jeans, plain t-shirt (slightly oversize and non-tucked) and white sneakers go well with a velvet blazer. In cold months, wear a velvet jacket as a topcoat over a waistcoat, a cable knit sweater or a denim jacket. Velvet blazers are workable in the office, unless sheeny jackets break the corporate dress code. Of course, steer clear of prints and patterns and pair your jacket with a crisp white shirt and a business silk tie. To wear it in your office, your velvet blazers should be ultra-fitted and matched with wool trousers.